Elizabeth Gannon has seen her share of broken crayons. As a preschool teacher at Morris Avenue School in the Long Branch Public School System, this 16-year veteran has swept up and picked up every color in the rainbow. So, when a close friend of hers tagged her on a post published by The Crayon Initiative (TCI), she knew that she’d just found a better place to toss her students’ worn out crayons. 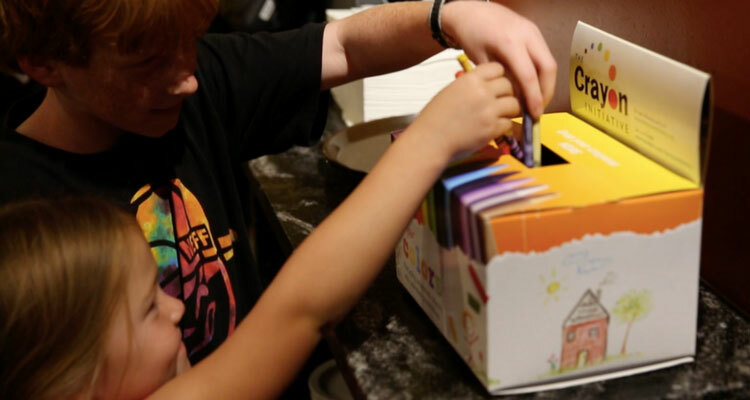 “…(I) thought this was a great idea and knew I’d easily be able to collect lots of unwanted crayons, especially at the end of the school year when we are all cleaning up and closing down our classrooms,” says Gannon. And collect them she did for a total of 28 pounds, which she dropped off this summer at a local A.C. Moore craft store during a crayon collection and fundraising drive benefiting The Crayon Initiative that went on to raise over $19,000. Send emails to colleagues inviting them to participate. Gannon sent out emails explaining The Crayon Initiative’s mission to all the teachers at her school and asking them to collect unwanted crayons throughout the school year. She plans to expand outreach to teachers in other schools in the district this school year in hopes of raising more awareness and collecting even more crayons. Encourage teachers to keep a collection box in their classrooms. Crayons don’t wait until the end of the school year to break or get lost. It happens all year long. Encourage teachers to keep a box next to the trash can in their classrooms to make collection easy. Get the kids involved, too. Kids love to help out. Give them a task and they’ll run with it! Ask teachers to explain the mission of TCI to their students and why it’s important for kids to help other kids. Create fun projects for the students to complete. Then reward them for a job well done! Create one central location in the school to house all collected crayons. Initiatives go sour when people have to work too hard to track down answers. Gannon identified one well-known location within the school to house all collected crayons so teachers could empty their buckets quickly and get back to class. Remind teachers that they can empty their classroom buckets in that bin as often as necessary, especially nearing the end of the school year. The task of emptying the bucket daily could also be a fun way to involve the students! Work with your school district’s sustainability efforts. Gannon is a member of the Long Branch Public School’s “Green Team.” The school is actively involved with and certified “green” by Sustainable Jersey Schools, a certification program for New Jersey public schools that want to go green, conserve resources and take steps to create a brighter future, one school at a time. Familiar with the various actions under the certification, Gannon honed in on the recycling of non-mandated materials. In her words, “crayon recycling fits this category perfectly!” Check to see if your school has a similar program. The Crayon Initiative is grateful for crayon advocates like Elizabeth Gannon who, through her role as an educator, help us spread the word about The Crayon Initiative in our schools. But she’s not alone. The children, faculty, and staff at Richland Elementary School in Johnstown, PA collected and donated 95.8 pounds of crayons recently, and have already started collections in two additional school districts. The 4thgrade teachers at King Elementary School in Deer River, Minnesota will be working with their students this Spring (after school work is completed!) to write letters to local businesses asking them to sponsor the costs of shipping the crayons collected to The Crayon Initiative. But, these are just a few examples of the stories we receive every year from educators wanting to help raise awareness of the mission of TCI while getting their kids excited about helping other kids and preserving the environment. You, too, can start a The Crayon Initiative school collection program at your school. Learn how. We know that there are more educators out there advocating for TCI and we want to share those stories with our Crayon Advocates community. So, if you’re a teacher or school administrator supporting The Crayon Initiative in your school, please send us a message on Facebook or through email, or mail us a letter! Your story may be featured on our new website. Our mission is to remanufacture crayons into brand new ones and provide them, free of charge, to children’s hospitals across the country to inspire creativity during a very difficult time. Your support is essential to helping us do that. We can’t do this without you!